The Millstone offers 4-6 bedrooms, including a luxurious Owner’s Suite on the first floor and oversized guest rooms on the second, allowing privacy and space for family members and overnight guests. Indoor/outdoor entertaining is a breeze, with the zero-corner sliding glass door option to completely open up the main living space and let the fresh air in. A game room, flex space, and 3-car garage complete this flexible home design. Step inside Millstone to see the Life-Tested Home Designs® with more usable space where you want it most. So you live the way you want to live. The Millstone floor plan is known for its first floor owner’s suite, allowing privacy from the oversized secondary bedrooms located on the second level. Beautiful cabinetry in the kitchen and baths adds elegance to these spaces. 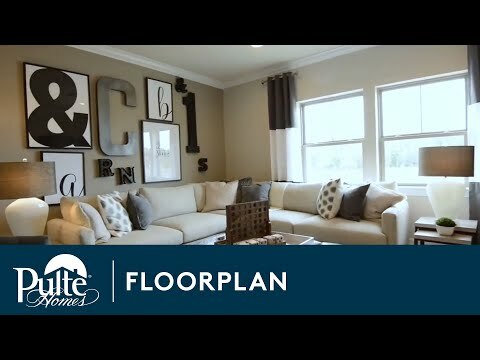 The included Pulte Planning Center® located near the main living area gives you the space you need to keep your busy home life organized. 9’4” 1st floor ceilings, granite countertops, designer kitchen cabinets, an open-flow home design with large kitchen island, LED recessed can lights for a softer feel, and plenty of garage space.